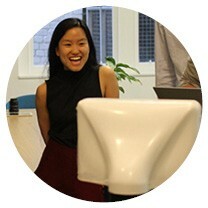 Marita Cheng, crowned the Robot Queen, has packed her bags to head back home to Queensland and she brought her Aubot telepresence robots (that let ‘you’ be in two places at once) with her. Marita left her hometown Cairns to study mechatronics and computer science at the University of Melbourne. In her first year at university she founded her first company, Nudge: a reminder for patients taking prescription medication. In her second year she founded Robogals, an organisation that encourages young girls to get into engineering which has taught robotics to 70,000 girls in 10 countries around the world since 2008. Now through her company Aubot she’s working on brain-controlled telepresence robots that allow people with disability to visit places remotely. We caught up with Marita as she plans her move back to Queensland with Advance Queensland’s Hot DesQ program. 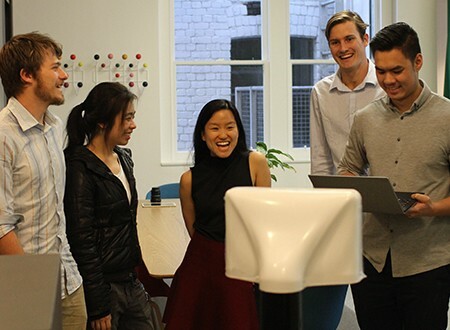 How did you come up with the idea of making telepresence robots, was it a light-bulb moment or a slower evolution? I spent a couple of years making robotic arms for people with limited upper body mobility, and a lot of people that I interviewed said this is like a dream come true, this is magic. So I thought, how can I give this technology to even more people and I decided to make a remotely controlled movable platform that we could put the robot arm on. 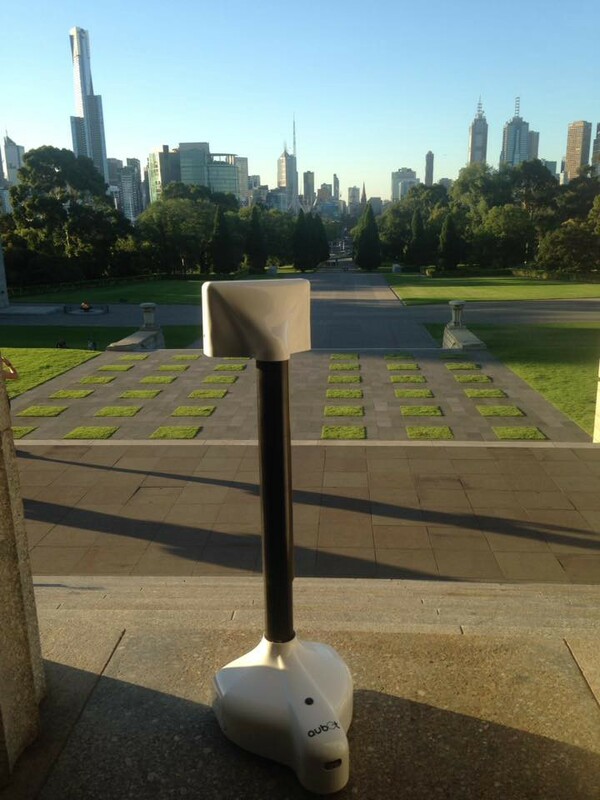 Then various CEOs said to me it would be really helpful if they could duplicate themselves, “it takes an hour and a half for me to go to work and back, but I still want to have a presence in the office, to go to meetings and occupy space”; they really wanted a telepresence robot. So I said, oh well then I’ll make one, and that’s how it all started. Was it always your goal to be an entrepreneur — or did it come through an unexpected pathway? It was something I thought about when I was growing up, but I didn’t actually know the word entrepreneur. I thought it sounded really cool to have my own robotics company, but I didn’t know what the reality of that would be like I just thought it sounded really fun. I didn’t know the word entrepreneur until I was at university, I saw a sign advertising this really cool new water bottle, and it said ‘entrepreneurship it’s about having a new idea and bringing it into the world, to learn more come to our talk’. So I went along and heard from a successful entrepreneur and thought this sounds like me. How did Robogals begin/what motivated you? I started a company in my first year at university called Nudge: a reminder for patients taking prescription medication. By my second year, I guess I had a bit more confidence and thought I’d like to do something really big with really big influence. Through Nudge we won an entrepreneurship competition and the Head of Electrical Engineering Department Professor Jamie Evans presented us with the award, and I was working on building a robot at the time so I asked him about some funding. He said he was interested in getting a group of students together to teach year six some robotics and get them interested in engineering. I thought that sounded like a really great idea to increase the number of girls in my class so I started making that happen. What are you packing to bring to Queensland from Melbourne? Not much! I don’t need all my coats and that sort of thing. I grew up in Cairns so I’m used to the hot climate. I’ll bring a couple of robots with me, so that will be most of my packing. Are you a list maker or a last minute throw it all in the bag type? I do both, so I make a list at the last minute and then I make sure I have everything on my list in my bag. What are you aiming to get out of moving to Queensland with Hot DesQ? I’m really excited actually! There are so many opportunities. I’m really excited about working with QUT robotics, which is why we are being based at QUT Bluebox. I’ve known Jonathan at QUT robotics for a while now and we’ve spoken about working together, so it will be exciting to just pop in to his office for a chat frequently about robots. What benefits are you bringing to Queensland? I’ve been building robots for a few years now, I really had to start from the bottom and kind of teach myself, even after university. University is very theoretical, so after I finished university and thought I want to start a robotics company I had to learn a lot. I can’t wait to mentor the teams at QUT Bluebox, which will be fun especially because they have a robotics accelerator program, so I’ll be able to chat to them and they’ll be able to learn from me. I’m really excited about the rural and regional areas as well, because I come from Cairns the regions are really close to my heart. I want to make sure people in rural and regional areas get opportunities as well, especially the younger ones, so they know what options are there for them in the real world. The Aubot team after they delivered their first robot last year in November 2016, taken by Aun Ngo. You have a long list of accomplishments and accolades, what would you say has been your greatest success so far? I like to say that the things that require the most effort are the things that are the most satisfying when you achieve them. It’s not the things that you can do overnight, it’s the ones that require years and year of hard work and dedication that’s when you’re the most satisfied. I think it’s always moving, what I’m most proud of. I always try to work on difficult things, I think it’s really important to be inspired by what you do, and I’m inspired when I’m challenging myself. Have there been any times when you considered giving up? Oh yeah! Plenty of times, but it doesn’t last long because I guess I’m just so intrinsically motivated by what I do so I’m like what else am I going to do, this is the only thing I’ve ever really wanted to do. So I just keep going and work hard and hope for the best. Let’s say I’m interested in working for you — what do I need an interest in? What are you looking for? I’m looking for people who are really curious and are really passionate. I give my team a lot of autonomy and I like people who come back who have gone above and beyond, who take the time to understand the project and the objectives. I like people who have that curiosity, think for themselves and make intelligent assumptions. Everyone in the team is an engineer, is technically minded and is a problem solver. The only way out is through. If you’re going through challenges don’t give up, just keep going. What is your vision for the future of aubot? I’m really excited about the robot arm we’re creating and I’m excited about launching that next year. If you liked this article, please click the 👏 button below to make it easier for others to find. Read more stories about Queensland start-ups, innovators, inventors, entrepreneurs, and community digital champions all helping drive change and make things happen. Advance Queensland is a suite of programs designed to create the knowledge-based jobs of the future, drive strong innovation and an entrepreneurial culture. From Louisville to Longreach: Roving Entrepreneur sets up new residence. Daniel Johnsen is the current Entrepreneur in Residence with RAPAD. He tells us how he has ended up in Queensland, his extensive experience with startup weekends (he’s been over 50 of them in seven different countries), and his first impressions of Outback Queensland. Miner’s canary in the age of space travel. We caught up with Alex Moss, CEO & Head Designer at Canaria and Product Development Director Dr Rob Finean in Brisbane’s Fortitude Valley. Alex and Rob are currently in Queensland taking part in the energy and resources sector focused Unearthed Accelerator. Meet Pycno: A startup tackling food security. Pycno is bringing continuous data monitoring and system control to agriculture. Now, one of Pycno co-founders, Gaurav Tyagi, is bringing his expertise to Queensland.